Kitchen cabinetry has become more than just extra storage space. Kitchen cabinetry is an imperative to a kitchen’s style and should be thought about when considering or completing a kitchen remodel.Cabinets are an important piece that can bring a kitchen together. Unlike kitchen flooring and countertops, kitchen cabinetry designs have not changed much, but there are still innovative features and styles that have emerged. Today, many remodeled kitchens across the nation feature cabinets that focus on minimalism and simplicity. Some kitchens, however, feature more bold and new cabinet options. Nonetheless, this year has introduced new styles in addition to bringing back some old ones. 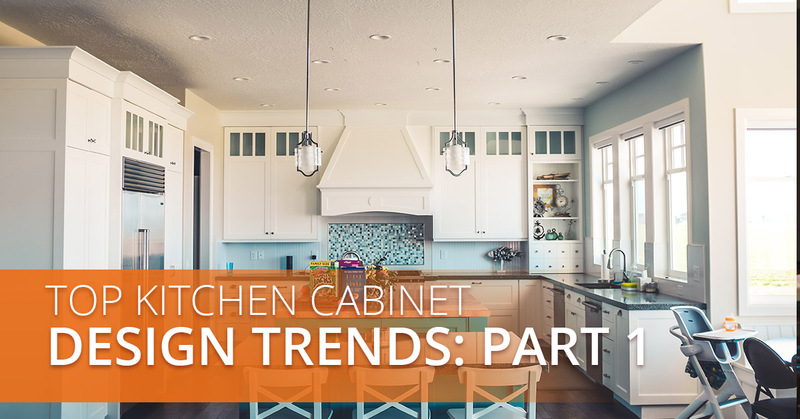 Through this blog and the next, we will be highlighting the top ten trends we have seen in kitchen cabinets. From unique and customized to clean and minimal styles, check out the first five of the top ten trends when it comes to kitchen cabinetry. Gone are the days of cookie-cutter kitchen designs. Homeowners want something unique that brings a bold statement and builds character, and the choice of color is an easy way to grab someone’s attention. Colored cabinets are becoming a trend in many modern kitchens, which have led cabinet manufacturers to partner with paint companies so that they can offer limitless colors to be inspired by. Light– loved for their simple look, light tones project a modern style and compliment other contemporary styles and elements in the kitchen. Medium– the most common color category, medium hues include the popular standard shades of blue, yellow, and browns. Dark– Compared to medium and light shades, dark shades are a bit more difficult to match with other kitchen elements. When remodeling their kitchen, most homeowners are looking for unique colors of cabinets that not only stand out but compliment the kitchen, as well. In the past, opening shelves have not been the favorite shelving option for most homeowners. Open shelving can become extremely cluttered and can make your kitchen look messier than it actually is. However, as long as you have good organization, open shelving can offer a really unique and modern style for your kitchen. Open shelving creates efficiency as you are able to see and grab what you need without having to search through cupboards and cabinets and is great for small kitchens as it creates a minimal and airy feel. Open shelving is perfect for the storage of utensils, mugs and cups, books, pots and pans, wine bottles, and much more. If you’re torn between contemporary elements and traditional design, then transitional styling may be for you. This style is perfect when you’re looking for something interesting yet comfortable. Transitional cabinets may have doors with a simple profile, like Shaker or pairing stained styles. To learn more about transitional styling in your kitchen, check out this article. With the help of technology, there are many different cabinet finish styles and colors. One of the most recent trends with kitchen cabinetry involves mixing different finish colors to create a bold and unique look. For example, the base cabinets may feature a natural wood look while the upper cabinets are finished with a white paint. Homeowners can avoid the traditional boring finishes by exploring different styles that can make a statement. You can check out our variety of Thermofoil finishes and paint finishes, here. Under cabinet LED lighting has become very popular in many homes. You can add LED lighting under your cabinetry by using LED pucks, strips, or bars. Adding lighting under your wall cabinets can help add light to specific kitchen areas where traditional lighting may not reach. It also can improve the overall ambiance of a kitchen. If you are not a fan of LED lighting, fluorescent and Xenon lights are great alternatives and can give your kitchen a unique look. 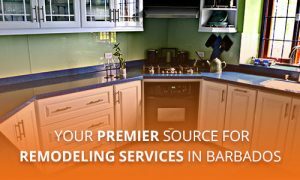 If you live in Barbados, or in the surrounding areas, and are tired of your current kitchen cabinetry, or are interested in doing a complete kitchen remodel, contact Fiberpol! In addition to countertops, we specialize in cabinets in homes. Our professionals can deliver and install new cabinets in your kitchen and throughout your residential or commercial property. For more information, or to schedule a free consultation, contact Fiberpol Inc.! And, stay tuned for the remaining top-five kitchen cabinetry designs by following our blog!